Reproduced from rediff.com as it is I hope that the reference to the original article is credit enough to the author, none of the following is my work in any way, whole credit goes to the original author and rediff.com. And our meagre subsidies (including free colour TVs [Get Quote] and the Rs 60,000-crore loan waiver) keep farmers in a subsistence mode -- neither can they quit nor can they continue farming. And that is the tragedy of the farm sector in India. Remember the oft quoted cliche -- our IAS officers are the best. And the logic of recommending this pay hike has been by pointing out to the fact that in comparison the pay packet in the private sector is significantly higher. If that were the case why are there no largescale migrations from the government to the private sector? The answer to that is simple -- power and pelf available to our government officers are a huge incentive to remain in the government. Yet, we seek to provide them higher salaries. IMG_2573, originally uploaded by Kapil-Garg. DSCN3663, originally uploaded by spread_smiles. DSCN3634, originally uploaded by spread_smiles. kya bola re?, originally uploaded by Vinu. IMG_2055, originally uploaded by Vinu. here it is!, originally uploaded by Vinu. We are being attacked, originally uploaded by mksfoto. 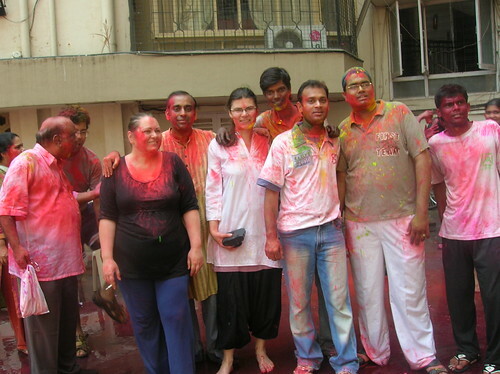 Well, Being away from home on Holi is the one of the most painful days I have experienced. 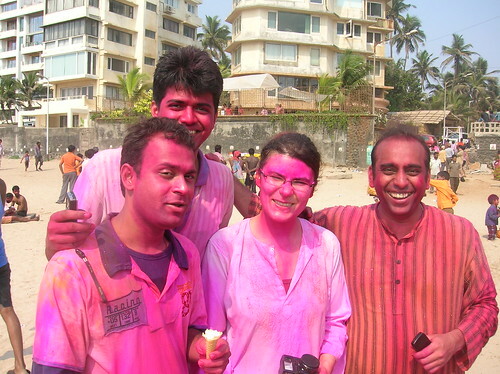 This is one full day of fun, being with friends, all colourful and removing all social barriers... 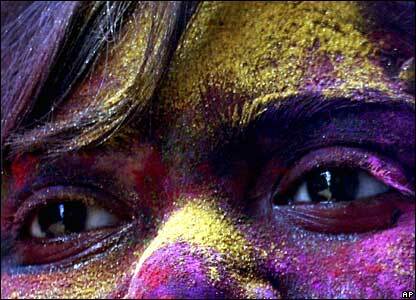 I love Holi. 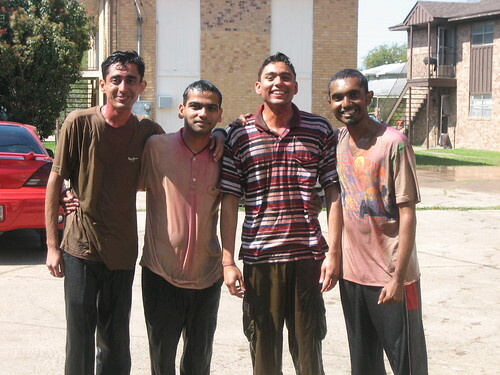 I have liked holi as long as I can remember it, and have almot always tried to be home for Holi, because its at home that you can actually enjoy the most. Old friends, elders, youngers.. everyone comes home for holi. Lately, there has been discussions on global warming, and effects of consuming petrochemicals on our environment. Among other things, this has generated a new buzz in the area of alternate sources of engery. There is talk about wind power, solar power etc. more than ever. There are practical reasons to look for that and potential upsides as well. When I look at India, I feel these two sources (others are not discounted) can and should play a major role in fulfilling India's energy needs. India has ample resources to generate power from both wind and solar sources. a perfect example of how the Indian desert (one of the larger ones around the world) can be tapped to generate some huge amounts of solar power. Well, I am no solar power scientist, and therefore cant comment on the technicalities and details around that, but I would very much like to know the reason that comes about and suggests that it cant be done. On wikipedia, there is a very interesting and encouraging page about situation of solar power in india. Also, checking the website of the Ministry of New and Renewable Resources shows that they have plans to expand in both wind and solar areas. Though this clearly show govt is thinking in this direction, I am sure people like me would love to see this happen in real life and not see these plans replaced by just another set of plans a few years later, without realizing much on the ground. India also has a long coastline, and I believe this could be utilized for generating some wind power. Geographically speaking, both eastern and western coastline of Indian peninsula has hilly regions, and I think these could prove to be interesting areas for installation of windmills. The idea is not really new for India, since India already is developing wind power generation faster than any other country around the planet. As this article on wikipedia mentions, Wind power in India, India is already the fourth largest host of wind power generation installations. When I tried to check how would it look like for an individual to install a solar panel or a windmill to fulfil his own energy needs, without relying upon the govt to provide for, google did come back with a few pieces of interesting information. Here's one page about how a family fought with administration to set up their own windmill, but eventually gained from it in long run. This page talks briefly about how to set up such a system for alternate source of energy and provides a few links here and there. Suddenly, there is a boom in the auto innovation sector, and I have to say very proudly, its coming from Indian companies. rediff.com: Tara Tiny @ Rs 99K is the world's cheapest car! I wonder, where was all this innovation till a few months back. For long long time, only news in auto innovation was coming from the bigger western players like Mercedes, GM, Ford, BMW etc.. or from Japan, where the likes of Toyota, Honda were leading. Suddenly, there is news after news from the Indian manufacturers, and I cant hide my happy surprise. Way to go, guys. काले नैनों वाली ने हो..
Now, I can claim to have an official presence on the cyberspace. I feel very very good about this. Before this, I have been using free services from blogger, wordpress or others like them to host my pages/writings. Its been sometime since I have been home on one of these festivals. For example, I love Holi and I haven't been home for Holi in last 3-4 years. :( And, Holi is not the only one. All the biggies in the annual Hindu festival list are the same. This time though, we had a chance to be at the local temple in Winterthur for शिवरात्रि (Shivartri). The temple is an ashram established by Swami Onkarananda. They have a similar ashram in Haridwar as well. The place is now entirely run/managed by local swiss devotees. All of them have spent at least some time in the ashram in Haridwar. They seem to have excellent knowledge of Sanskrit, not so much of Hindi. When they were performing the Shivaratri abhisheka, I was stunned to listen to them chanting original sanskrit shlokas and mantras, quite perfectly. I really really liked it. There I met one more person, Bhaskar (भास्कर). Born a Swiss, he has been educated in haridwar and here in Switzerland as well. He had an excellent pronunciation of the sanskrit Shlokas. It turned out that he had studied sanskrit in Haridwar for a long time (few years I guess). He claims knowledge of Vedas (वेद), and I dont think he's lying. With the kind of knowledge he was showcasing there, I could easily imagine him knowing some of it. Later I learned that he's teaching people Sanskrit from the temple premises. A very nice thing in my opinion. Also, that he's starting (or already started) classes for kids on Veda in general. In my view, a very very nice thing to do, especially that the knowledge about Vedas etc is not so much present in normal Indian's life. All in all, the Shivaratri trip to the temple, turned out to be very interesting.